Nikon has said that it is not concerned about the downturn in compact camera sales, and is instead showing growth in several areas of the market. According to research figures, there was a 30% decrease in compact camera sales in 2011, attributed in part to the proliferation of well equipped smartphones. That didn't stop Nikon revealing a host of new compact cameras on to the market earlier this week, with the company affirming that it is still doing well in what it described as a "shrinking market". Speaking at the launch of its new range, Jeremy Gilbert, Nikon's UK Marketing Manager said that the company wasn't threatened by smartphones, "I think people taking photos on phones is a good thing, because it's still getting people interested in photography." "They [smartphone pictures] are a bit more throwaway though. Camera images are for more cherished moments, so there will always, always be a place for cameras." James Loader, Product Manager for Coolpix in the UK backed that up, "We're growing in a declining market. There's no shying away from the fact that it is a declining market, but there are some sections that are really growing." "The under £50 and over £200 section are still growing, it's the mid-range that it is really being hit hard, and that is the bit of the market that we are the strongest in anyway." 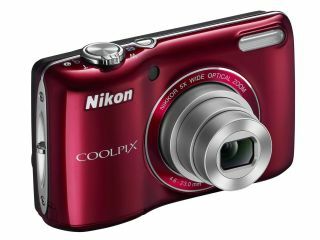 In 2011, the £70 Nikon Coolpix S3100 was the biggest selling compact camera in the UK and Europe, increasing its market share from 6% to 12.9% - almost 1% above its targets. For the upcoming year, the target is 15%, Loader told us. "Our cameras offer more advanced optical performance than a mobile phone, and mobile phones are still sluggish, they aren't as responsive as a camera," Loader continued. "For event photography, such as holidays, birthdays and weddings, nobody is going to rely on their smartphone for images. "It is still a big market - we just want to take more of it." Nikon's new range of compact cameras includes the Nikon Coolpix P510, a 42x optical zoom bridge camera and the Nikon Coolpix S30, a waterproof and shockproof camera designed as a "family" camera.